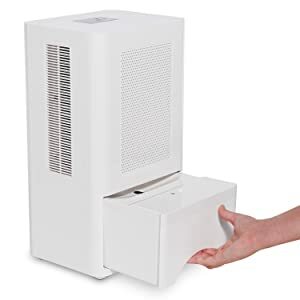 Eliminate mold, mildew and odor, and say goodbye to the noise and bulk of conventional dehumidifiers. 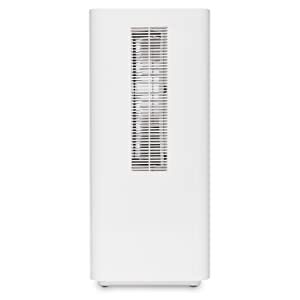 With this Compact Dehumidifier from Ivation, thermoelectric technology dries out every damp, difficult-to-maintain area. At just 9.4" x 17" x 7.5" and weighing in at 10.7 lbs., the super sleek unit is easy to transport and set up, even in tight quarters. Unlike noisy, wasteful compressors, this portable wonder is energy-efficient, extra quiet and still removes an unprecedented 2 liters of water per day. A 2-speed fan, cooling circulation system, adjustable humidistat, continuous drain hose and automatic shutoff also add to its superior efficiency. For the largest, most feature-packed thermoelectric version on the market. The unit's compact, portable design is ideal for any small, confined space in your home including attics, basements, dens, foyers, crawlspaces, bedrooms, bathrooms and beyond. Restore quiet and calm with thermoelectric peltier module technology, which eliminates bothersome blower noise. Operating without moving parts, the unit stays whisper-quiet. Boasting a 3-liter water tank with easy-clean cover, the appliance uses less energy thanks to integrated auto-shutoff, which avoids leakage, and auto-humidistat, which saves electricity. Program the machine to the precise RH level, and watch it handle the hard work. A built-in humidistat not only displays the room's relative humidity, but also automatically adjusts to changes in temperature and pressure. Set your desired RH level and fan speed for no-hassle operation. The helpful LED indicator alerts you when the tank is full, while smart memory remembers fan speed and other settings after power loss. Various automatic features For less labor and mess. 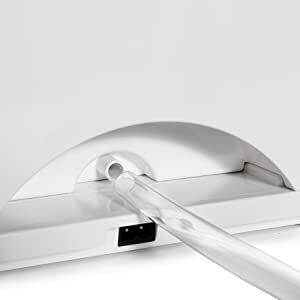 The unit powers off on its own when the tank is removed or full, while its easy-clean design makes maintenance a breeze. Never worry about manual draining. Just attach the included hose and allow the reservoir to drain continuously into a sink, tub, floor drain or other outlet. This convenient feature ensures maximum uptime.